Malbec is one of those polarizing wines. People either love 'em or hate 'em. And yet, for the money, they can't be beat. There are MANY great Malbecs under $20 a bottle. This is the 2010 Diseño Old Vine Malbec and like a good deal of Malbecs, it's from the Mendoza region of Argentina, of course. Specifically, this is made from grapes grown in Lujan de Cuyo and the Uco Valleys, if you were wondering. The grapes are grown from "old vines," which lead to a better tasting, more flavorful and complex end product. Okay, enough backstory, on to the wine! 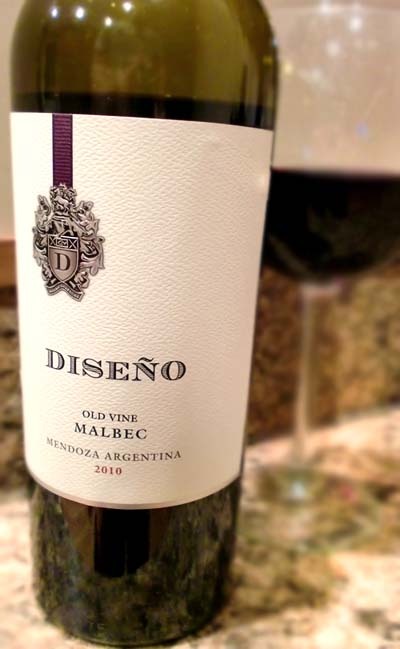 Diseño Old Vine Malbec pours a deep, dark violet verging on black. It has aromas of raspberries, vanilla, and leather. Tasting gives you dry blackberries, stone, black licorice, and a long earthy, bitter finish with moderate tannins. This is a full-bodied, earthy and dry Malbec. While it certainly isn't for everyone, I loved it. There are a lot of different and interesting things going on here. I believe this costs between $10-14 most places. Don't Drink This: if you want a sweet or restrained wine.